Water is a source of very many ailments both in the home and at work equally. Without knowing it, we may ingest materials or microorganisms that are harmful to our bodies causing us harm in the form of illnesses, sicknesses infections. In this light, we need to be very careful and cautious about the water we take into our system taking great care not to ingest water that is not well treated or filtered or harmful material and microorganisms. People use many ways to try and get rid of these substances by employing methods like boiling, using chemicals among others. For me, I trust the New Wave Enviro 10 stage water filter system to make my water safe and secure for drinking and cooking. This product gives you the peace of mind you need when having your water that nothing is swimming or floating in your drinking water that shouldn’t be there. The water filtering system is a system that is supposed to work independently and perform basic tasks perfectly and as expected. For example, the flow of water from a filtering system should never stop unless prompted by a person and the water produced should be clean and decontaminated. This product provides a constant supply of water that is fresh and with most contaminants removed. It is a hustle, an involving one, to use a machine that’s hard to operate and requires too much expertise to decipher. How is settling it to have a machine that you can very easily operate and use every day without struggling and be forcing? That aside, it is also very easy to set up, which gives you an easy first time which as we all know gives an impression that is lasting. 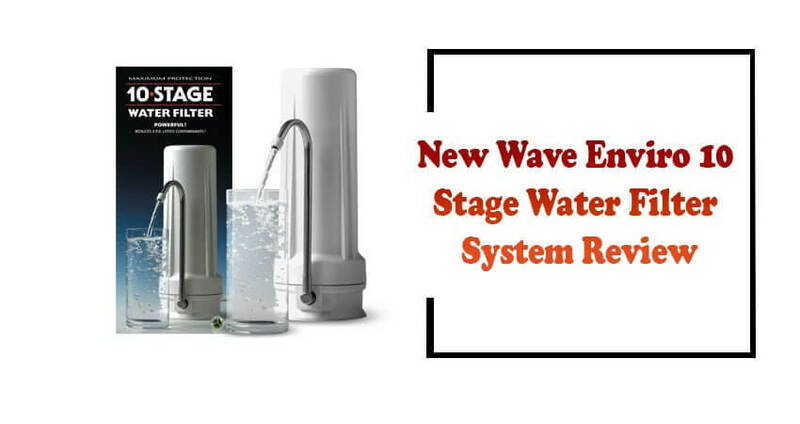 The new wave enviro 10 stage water filter system is made to be easy to set up and quickly attaches to your faucet, and you immediately begin using it. A complete system is one that after using up its raw materials or after capturing any undesired factors, it is well able to deal with those factors thus saving the users or people using it a whole lot of work and energy. This product is made with this mind in that after the undesired material is absorbed from the water, it is left behind and not loosely or carelessly dumped for anyone to clean after. Nothing gives a buyer more faith in a product than a manufacturer who backs his/ her product with a warranty or money-back guarantee to say that in case the machine breaks down or malfunctions, you can always bring it back and get a refund. In this way, you know the manufacturer has put their all into the product to make sure these eventualities don’t arise. This product has a 30-day money back guarantee and manufacturer’s warranty in case of any breakdowns or malfunctions. To maintain and keep machines or devices in good condition especially ones that break down easily can be an expensive and daunting affair. Therefore, it is advisable to go for products that guarantee little to no maintenance so that you are saved the cost and hustle of carrying out this exercise. In that light, this product is made with a filter that produces approximately 1,500 gallons of water before it needs any replacement or maintenance. Is this a reverse osmosis system? No it has multiple stages it goes through that removes heavy metals and chlorine. How can you tell when to replace the filter? I replace my filter when the flow of the water slows down. Taking care of one’s health is the biggest priority anyone should have, and as such you need products like this one to assist you to do the all-important job of keeping you safe from illnesses. This product stands out from many already in the market, and it would be an awfully wise idea to invest in one for safer drinking water.